Well, it looks as though I worried unnecessarily about last week’s puzzle, Flying Tortoise’s Good to Go and I completed it correctly. 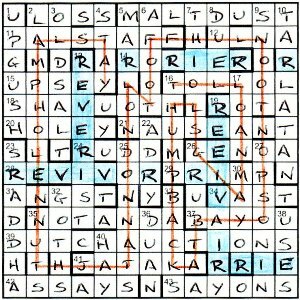 My main gripe was that it was possible to complete the puzzle without fully understanding the theme. Actually, ‘gripe’ may be too strong a word; ‘niggle’ would be better. I also felt that the bottom row would have been better had it been BY THE PRICKIN’ OF. Anyway, I seem to be in the minority all round on this, so may I extend encouragement to Flying Tortoise for another puzzle sometime (assuming that he/she isn’t an old hack using a special pseudonym). Thanks also to Gail for help with the ninth clue missing its G.
And so, on with this week’s puzzle. It was with some trepidation that I opened my copy of The Times on Saturday morning. I was off for a week of golf on the Monday, so only had bits of two days before I went and the Tuesday after I got back to finish the puzzle. I was dreading a Sabre, Pieman or Shackleton, and while it wasn’t one of those, Merlin was a name that brought back memories of a past defeat, namely Olde Treasure Hunt. I guessed that I would probably be faced with a challenge. I read the opening of the preamble: “The crossword is based on a famous puzzle.” A glance at the title, and I assumed that the theme was going to be the seven bridges of Königsberg, possibly involving Euler’s proof that you couldn’t take a walk that crossed all bridges once and once only. It looked like I was half way home. Make that ‘a tenth of the way’. The clues, as I expected, turned out to be tough to start with, many of them (about 60%) containing misprints. Surmising that Euler could be the ‘relevant name’ spelt out by some of the misprints didn’t really help much. And anyway, I might have been on completely the wrong track with that line of thought. I started fairly slowly: 12 ULNA, 31 ANGST, 35 NOTANDA and 37 BAYOU were the only acrosses I got early on, followed by 3 OLD SALT, 23 SRADDHA, 30 MAYOR and 32 GOTHS for the downs. With so many misprints, I think it’s just a question of getting a smattering of normal clues and possibly some obvious anagrams or hiddens with misprinted definitions (such as gANGSTers in 31ac defined by Feat Fear, and ghost GOTHS with brief grief in 32dn). And so onto the endgame. The corrected misprints spelt out Shade river blue. Konigsberg. Euler. At last my hunch was proved correct, and I searched for the River Pregel in the grid. There were four Ps and only two Gs, but no R, E or L that could combine to spell out the river’s name. I printed out a large version using Sympathy, something I often do if I can’t see anything obvious with my scrawly writing in the grid. A few minutes later and I was highlighting all the Rs, Is, Vs and Es in the diagram, et voilà, a nice representation of the city of Königsberg with its seven bridges. Each bridge was marked with a type of bridge or the name of one: TOLL, BAY, TAY, LONDON, FOOT, HUMPBACK, PONTOON. While searching for the thematic objects, I was lucky, as no doubt many of you were, to come across the devious little TUNNEL going up in column 2. This would obviously make possible the impossibility of crossing the bridges without additional help. And then, early on Sunday evening, with essential packing for my golf trip still in front of me, I came to an abrupt halt. Try as I might I couldn’t find the route across all the bridges and through the tunnel in a single continuous path. I printed out my grid, with the river shaded blue, the bridges green and the tunnel grey. This grid accompanied me to Portugal, where I dipped in and out of the problem and suffered the strange looks of my fellow golfers (luckily only five of them). It then accompanied my back to the UK a week later … still unsolved. I drew a simplified map of the city, and joined up the various points, labelling them with the names of the bridges. Unfortunately, the positioning of Tay, London, Foot and Humpback meant that I couldn’t find a way of creating the path without having lines cross and that was forbidden by the preamble. Moreover, Toll and Bay entered the right hand side of the grid, but only Pontoon left it. The options available for the tunnel looked like being AIG, MES, NEL, NEG, AES or ORL. I Googled the first, and was surprised to find that it was a hole, pit or tunnel in the Sudan. Could that really be the way out? It certainly made the walk possible, requiring two tunnels to cross the river, now a total of nine times. After a bit of further investigation, I could find no other solution. Not for the first time this year, I pitied anyone without access to the Internet … and also wondered whether I had gone up a blind alley, and the solution was stupidly straightforward. After all, how did Merlin manage to find the Aig?! Whatever the outcome, this was great fun. Thanks. This entry was posted on 19 October 2012 at 3:55 pm	and is filed under Solving Blogs. You can follow any responses to this entry through the RSS 2.0 feed. You can leave a response, or trackback from your own site.